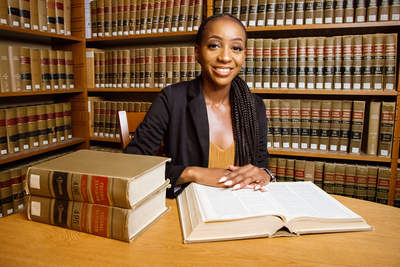 Sociology major Denise Branch gained valuable perspective from her internships at local law firms. It may not be universally true; it’s the conclusion of just one study four years ago. But for Nicole Holtzclaw-Stone, the director of undergraduate studies for the department, it makes the point: Internships matter, even in fields of study where they’re not always assumed. The good thing is that students don’t need to leave the university community to do an internship, and summer is not the only option. Liberal arts and sciences students also have a place to find those opportunities at LAS in C-U, an annual fair that connects Champaign-Urbana employers with students seeking spring and summer internships. The fair this year is Nov. 6, with optional prep sessions about a week earlier. The target audience is students in LAS, but all students are welcome. Last year’s list of participating employers included health care providers, nonprofits, research labs, police departments, publishers, media, insurance companies and park districts, among others. The internship possibilities were equally broad, taking in almost four dozen types of work, ranging from data modeling to graphic design, copy editing to health administration, and landscape architecture to project management. Most of the internships don’t require specific training, and liberal arts students should keep in mind that they often possess skills that employers are looking for, Holtzclaw-Stone said – among them, skills in communication, analysis and research, as well as people skills and a global awareness. Even when students don’t necessarily need an internship on their resume, the benefits can be significant. That was the case for Denise Branch, a senior in sociology from New York City who had started college with plans on going to law school. Branch knew that internships at law firms were not something law schools expected to see on applications, but she wanted the firsthand experience and thought it would demonstrate her “genuine interest.” Going into her junior year, “I kind of told myself I have to make the time for it,” she said, despite the demands of being a student- athlete in cross-country and track. She skipped the trip home for winter break to do a full-time internship for six weeks at a local firm, then did a part-time internship at a different firm during the spring semester. She learned some things about what she might want to do in a law career, but, even more important, what she didn’t. “That was the biggest takeaway I had from my internship experiences was that I knew what areas of law I didn’t want to go into,” as well as the types of working situations she might want to avoid, she said.